It’s that time of year when we start updating the wardrobe and nestling in at home as cooler weather sets in. What better way to find that perfect something to cosy up with than exploring Melbourne’s distinctive markets during autumn? Some of Melbourne’s coolest jewellers, fashion designers, illustrators, artists and makers are gathering to help you find a distinctive gift for mum. And maybe something for yourself too. Browse the stalls at Boho Mama – Mother’s Day Market to the sound of positive-vibe-building tunes. Pause for a drink and bite, including guilt-free vegan treats, and get inspired by the fashion show featuring sunny Byron Bay labels. Sunday 28 April. Did you know there’s a street market in Chinatown every second and fourth Saturday? This Heffernan Lane takeover kicks off in the late afternoon, but as the sun sets it feels like an Asian hawker market. Lights and lanterns start to glow, and the sights, sounds and scents of Chinatown Market Day’s food stalls excite the senses. Discover the best that the west has to offer at the monthly Kensington Market. There are at least 70 stalls offering an eclectic mix of good things, from fresh produce to antiques and fashion. Browse to the sounds of buskers and happy conversations between makers and shoppers. Held the third Sunday of the month. Want to make your nest snug and welcoming this autumn? 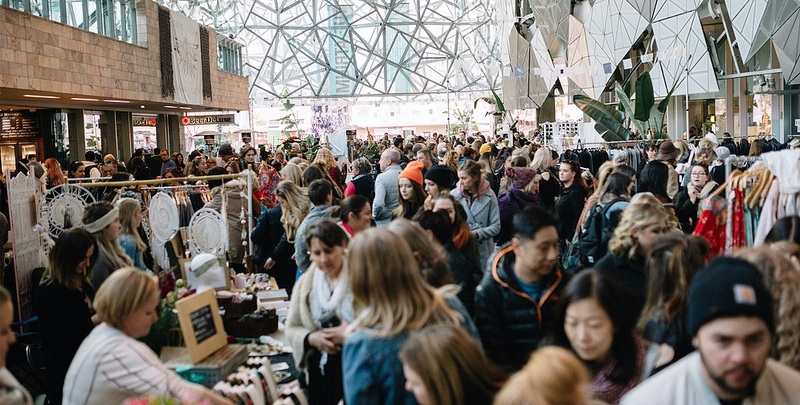 The Melbourne Collective Market’s stalls will be a great source of inspiration, but hurry because it’s only on 3 March. This all-day home, interiors and design event also offers fine food, live music and kids activities. Plus that good feeling of supporting local small businesses. Since the 1860s, the National Gallery of Victoria has published and distributed thousands of scholarly publications. 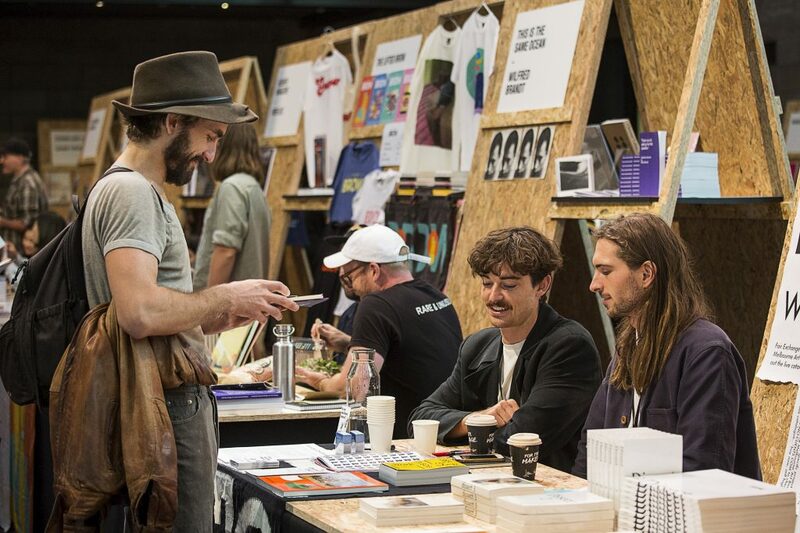 So who better to host the Melbourne Art Book Fair? The NGV’s Great Hall will become a marketplace for art and design publishers, and also a place to exchange pre-loved books. There are also talks, workshops and an all-day symposium. 15-17 March. As the days grow cooler, thoughts turn to snuggling up on the couch with a good book. Stock up at the Melbourne Book Market, on every Sunday afternoon until 16 April. Choose from over 5000 new and pre-loved tomes carefully selected by 15 of the city’s best booksellers. Authors and illustrators are also on hand to show off their creations, plus there are secondhand CDs and records to check out. 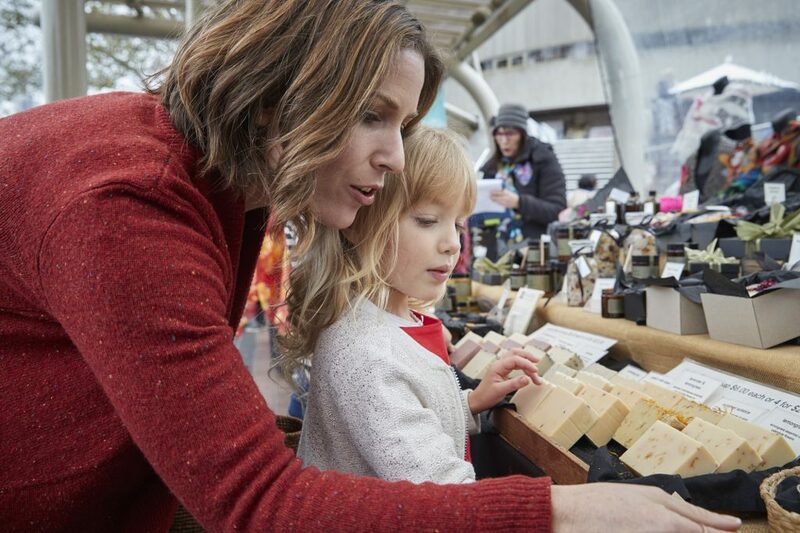 Whether you’re seeking treats and treasures for him, her or you, try the ever popular Arts Centre Melbourne Sunday Market. It gathers more than 80 unique, creative stalls that have become weekend institutions on the CBD’s southern edge. From silk scarves to decadent nougat, everything is handmade locally. Discover how living well doesn’t need to cost the Earth at Australia’s biggest ethical lifestyle festival. Get inspired by everything from fashion shows to cooking demonstrations at the Fair@Square Ethical Lifestyle Festival, now in its 10th year. Browse market stalls, enjoy entertainment and let your little ones loose with kids activities. 6-7 April. Stroll by the water and get a fresh perspective on Melbourne at the weekly Docklands Sunday Market. Looking for recycled designer kids clothes? Want to be surprised by unusual finds like locally made kaftans and semi-precious gems? Just want to amble along with coffee and Village Bakery treats? You got it. All trams to Docklands are free, and the market is just a few stops from the CBD on New Quay Promenade. 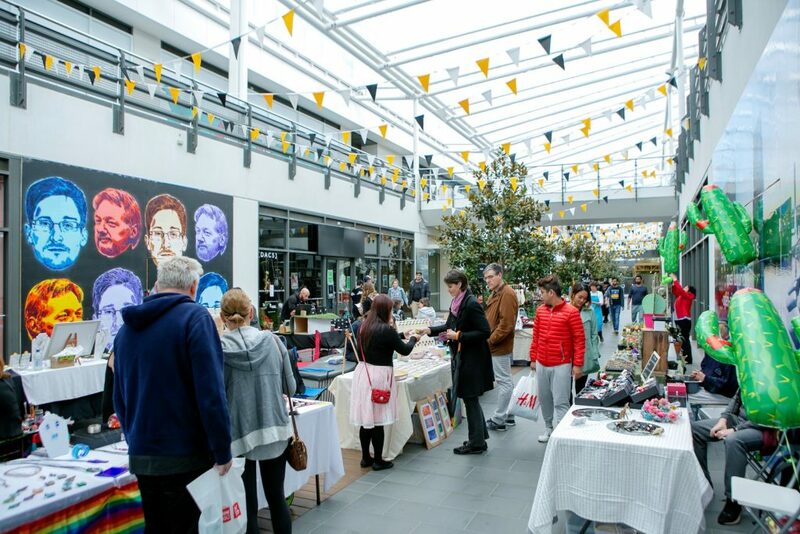 Brought to you by Fitzroy’s famous Rose Street Market, Docklands’ own arty-crafty market offers an ever-changing line-up of creative, colourful, tasty stalls. From jewellery and homewares to artisanal produce, many delightful discoveries await every Sunday afternoon at The District Makers Market. Plus tasty treats and live entertainment, with everything under cover.